The shores of the California coast and the waters adjacent to these areas are rich in wildlife including arthropods, birds, fishes and mammals, making the region a favorite among wildlife viewers. The wildlife along this region ranges from small crabs to playful sea lions to large humpback whales. Pinnipeds are marine mammals with four fins or flippers. Seals, sea lions and walruses are the three types of pinnipeds. 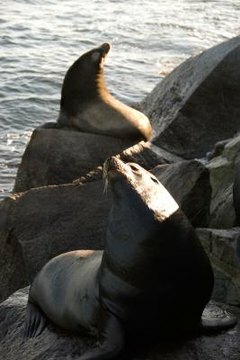 Of the three families of pinnipeds, only two are represented in California: seals (Phocidae) and sea lions (Otariidae). These mammals spend much of their time in the water, although they come on land to mate, give birth, rest and molt. The California sea lion is the most abundant and common pinniped in California, followed by northern elephant seals, according to the NOAA's National Marine Fisheries Service Southwest Regional Office. Other California pinnipeds include Pacific harbor seals, fur seals and Steller sea lions. The California coast is known for whale viewing with a handful of species making their presence known. Baleen whales, including gray whales (Eschrichtius robustus), blue whales (Balaenoptera musculus), humpback whales (Megaptera novaeangliae) and minke whales (Balaenoptera acutorostrata) call the waters along California home during some parts of their lives. The gray whale reaches lengths of just under 50 feet. Although this is a migratory species, some specimens prefer to stay in the waters along North America's west coast. Humpback whales grow to 56 feet and are particularly energetic, offering tail-slapping, breaching and singing. Several toothed whales also inhabit the waters along California's coast including bottlenose dolphins (Tursiops truncatus), Dall's porpoises (Phocoenoides dalli) and sperm whales (Physeter macrocephalus). Numerous birds inhabit the coast or shorelines of California. The sooty shearwater (Puffinus griseus) come to the California coast every spring and summer. A distinct population of marbled murrelet (Brachyramphus marmoratus) is the only seabird that nests in trees. The endangered California least tern (Sterna antillarum browni) has a momentarily stable population of approximately 7,500 birds. Other birds include brown pelicans (Pelecanus occidentalis), western gulls (Larus occidentalis), Pacific loons (Gavia pacifica) and double-crested cormorants (Phalacrocorax auritus). Several types of marine turtles, or sea turtles, inhabit the Pacific waters off of California. The green sea turtle (Chelonia mydas) is the most common California sea turtle and can reach close to 400 pounds. The largest California sea turtle is the leatherback (Dermochelys coriacea). These large, rubbery turtles can reach almost 9 feet long and are most commonly encountered off central California during late summer and early fall. These large sea turtles are facing extinction. Other California sea turtles include Pacific hawksbilla (Eretmochelys imbricata bissa); the largest hard-shelled sea turtle, the loggerhead (Caretta caretta); and the smallest sea turtle, the Olive ridley (Lepidochelys olivacea). Several invertebrates also inhabit the California coast and the adjacent waters. California animals belonging to the phylum Echinodermata include bat stars (Asterina miniata), ochre sea stars (Pisaster ochraceous), giant knobby stars (Pisaster giganteus), purple and red sea urchins (Strongylocentrotus spp.) and warty sea cucumbers (Parastichopus parvimensis). Several anemones and crustaceans are also common sights in the waters and shorelines of California.